In all of Hybopress themes we have most power feature called “Theme Layouts”, with which you control the overall layout of any page. There are 4 layouts available in theme. Note: It can be different for you, depending upon the child theme you are using, as child themes can have set their default option differently. (1) 1 Column Wide (It spans to Full Width (100%) of the page container). – Use this if you want to have no sidebars but content span to full width of page container. 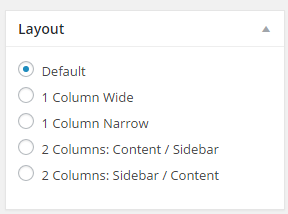 – Use this if you want to have no sidebars but it will not be as wide as 1 Column Wide layout, will have narrower width than 1 Column Wide layout. – Content with a right sidebar. – Content with a left sidebar.